(*The guide will meet you at your hotel, the time and place can be changed at tourist’s will. Transfer (2 days) is included in the tour price. 09-00 Meeting with a guide at the hotel. 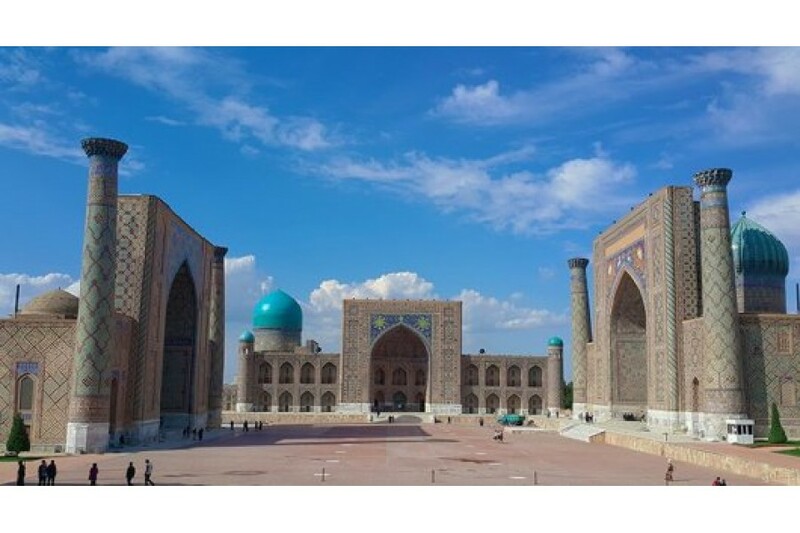 The excursion will begin with a visit to the symbol of Samarkand - Mausoleum Gur-Emir (the tomb of Amir Timur and his children). Next, we will proceed to the nearby Rukhabad Mausoleum. Then the tour will continue on Registan Square. The Registan Square is a complex of three monuments: Ulugbek Madrassah (15th century), Sher-Dor Madrassah (17th century), Tillya Kori Madrassah (17th century). Within a 5-minute walk there is the majestic and largest Bibi Khanum Mosque. This building will make an unforgettable impression on you. Near the mosque there is the famous Siab Bazaar, which is more than 500 years old. Not far from the bazaar there is another Hazrat-Khizir Mosque and the Royal Necropolis of Shahi Zinda (the Living King). Next we will visit the Museum at the Ulugbek Observatory, which was built in the 15th century to study astronomy. After that, we will go to the ancient settlement of Afrasiab, where the Afrasiab Museum is now open. Then we will proceed to the northern suburb of this settlement, where on the steep bank of the Siab River is the tomb of Khoja Daniyar, better known as the Prophet Daniel, who is equally honored by the followers of Islam, Judaism and Christianity. At this point the tour ends. Free time will be given until next morning. Duration of the tour is 6-7 hours. 09:00 Transfer to Shakhrisabz (1 hour). Arrival in Shakhrisabz. Visit to the Palace of Ak-Saray, Jakhongir Mausoleum and Omar Sheikh, the Mausoleum of Dor-ut-Tilovat, where the father of Amir Timur and his spiritual mentor are buried, and the Kok-Gumbaz Mosque. 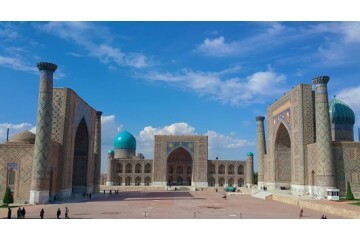 13:00 return trip to Samarkand. On the way, we will stay for a while at a mountain pass and have a lunch on the nature. You will taste the national meat dish tandyr-kebab (tender lamb meat cooked in tandir). After lunch, continue moving to Samarkand.